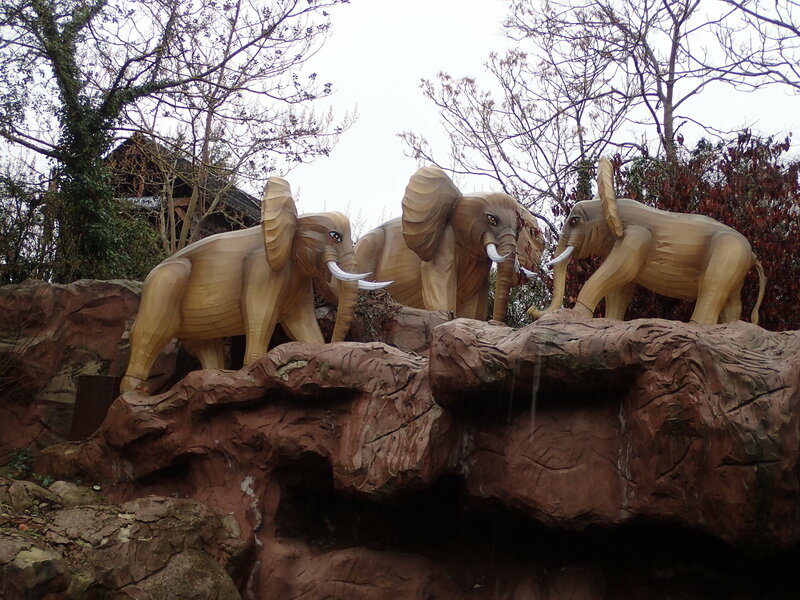 Sven: First theme park of the year! The off-season in Europe has started but here and there you can still visit a park. 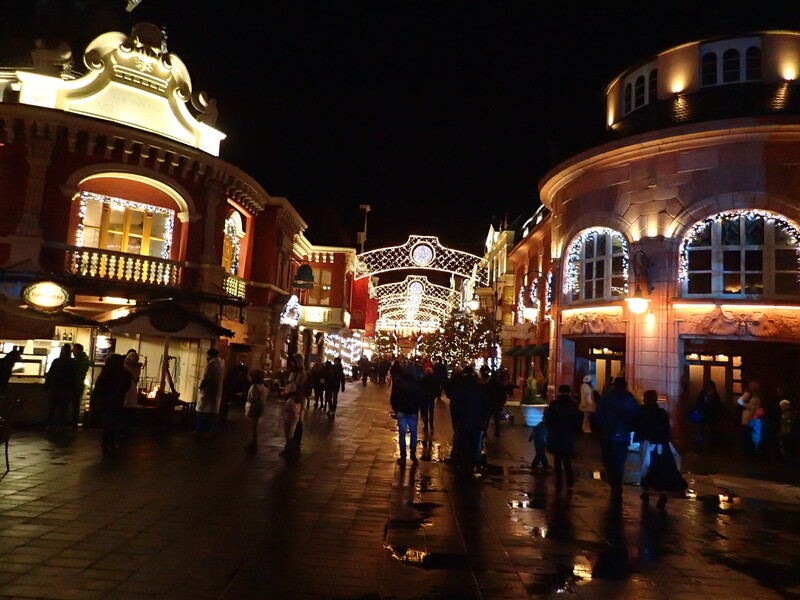 One of those, fortunately for us, is Phantasialand! 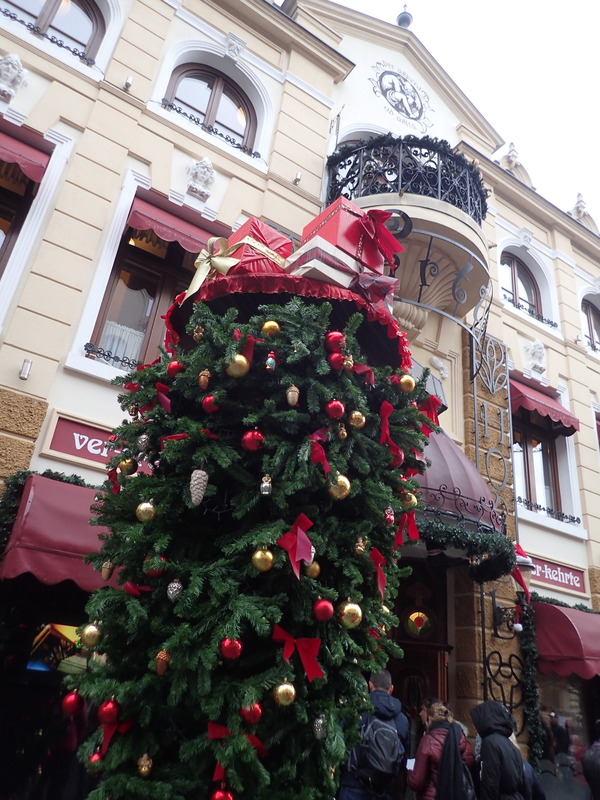 A final touch of Christmas atmosphere! 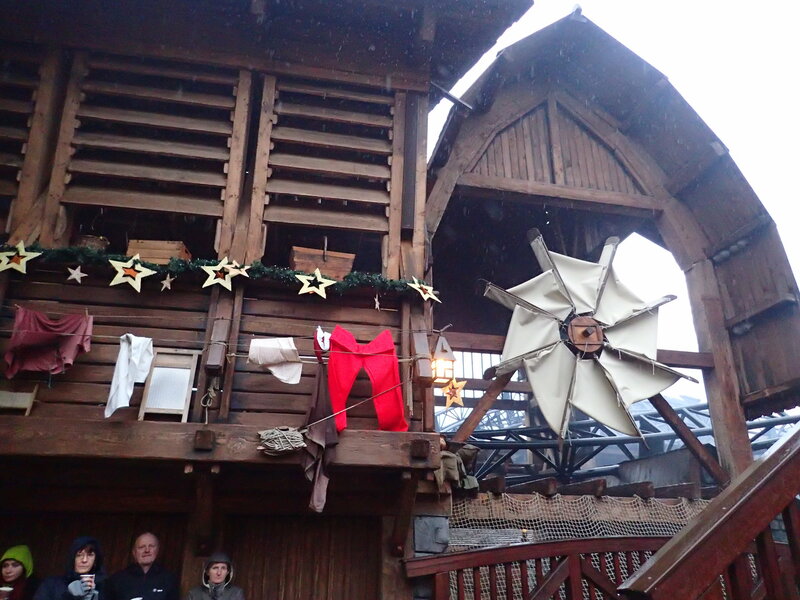 First aspect of Wintertraum: giant Christmas decorations! 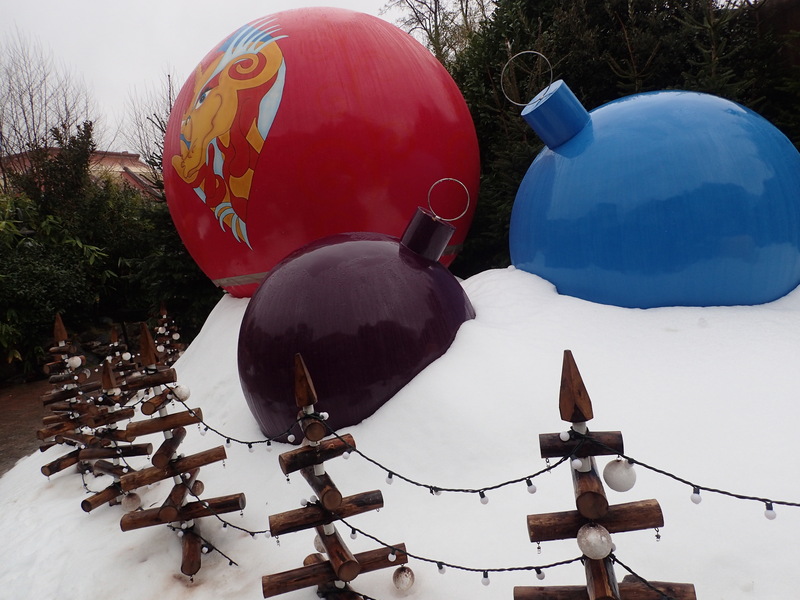 Every themed area has a dragon and every one of them gets represented by a giant Christmas ball. Here in the Mystery Zone, it’s Schneck! Most of the winter atmosphere can be found in Berlin. 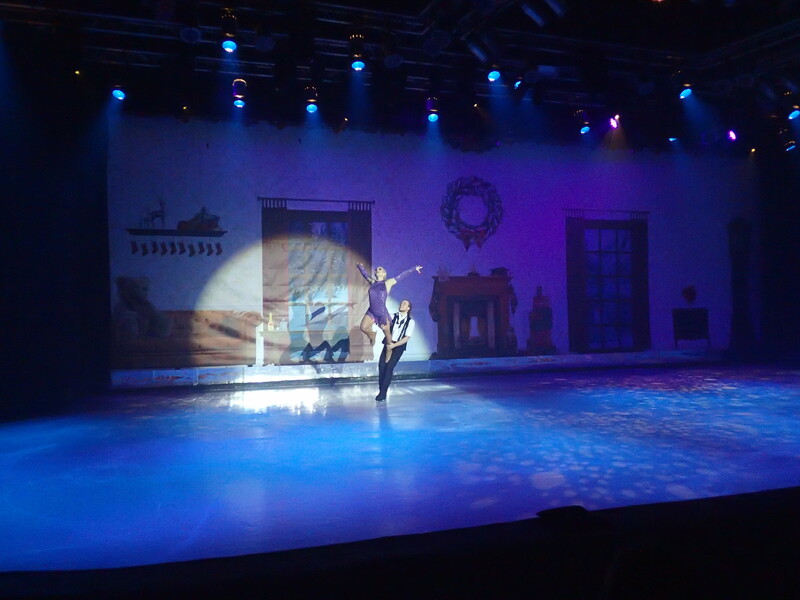 Besides Christmas stalls with winter specials, there’s an ice skating rink. You might notice that the pictures look a bit darker compared to the Florida or California ones. But there’s no escaping the West European weather… Actually, it wasn’t too bad temperature wise for the time of year, but it was really wet… So the fires all around were more than useful! 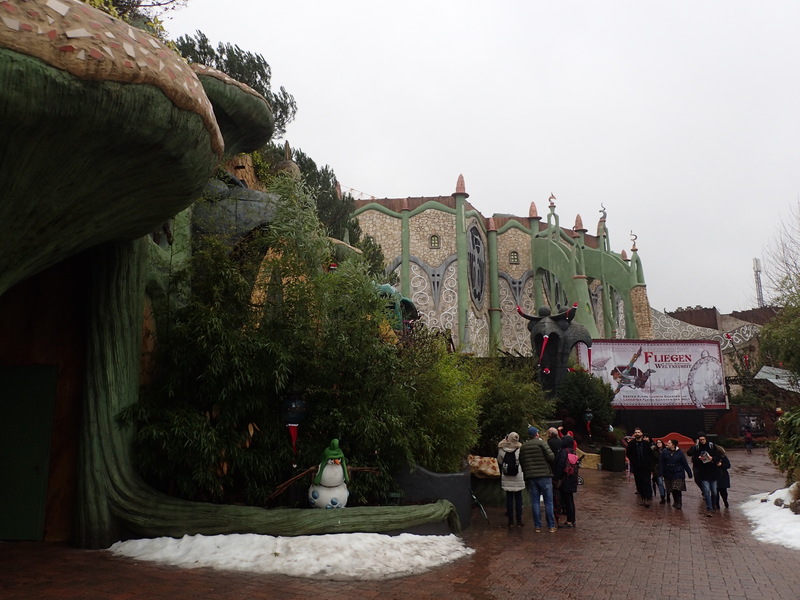 Mind you that they also put real snow all over the park! As for F.L.Y., it’s hard to spot anything anymore due to the large decorated wall. It does look stunning and feels as if it has always been there. 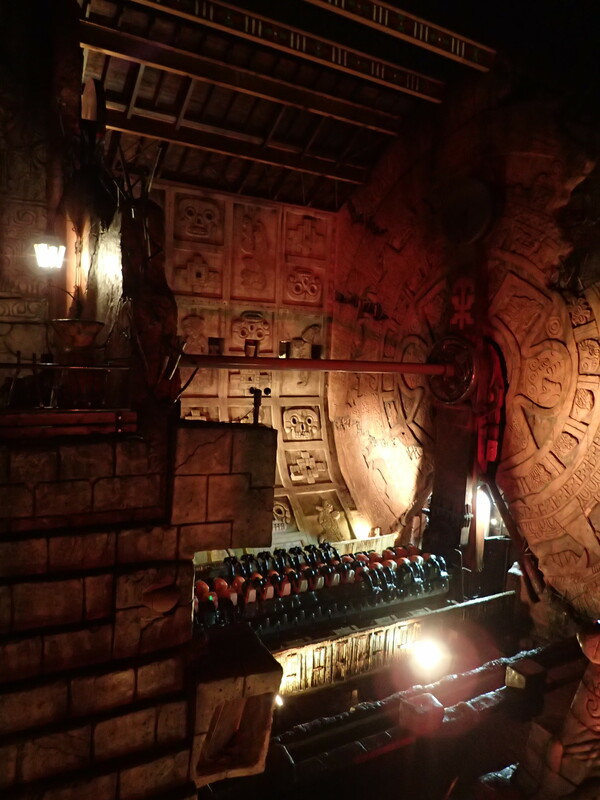 Rumors are going around that it will be hard for Phantasialand to open the ride this year as they probably want to open the whole of Rookburgh at once. And there’s still lots to do. We’ll see as the park hasn’t officially released any date. 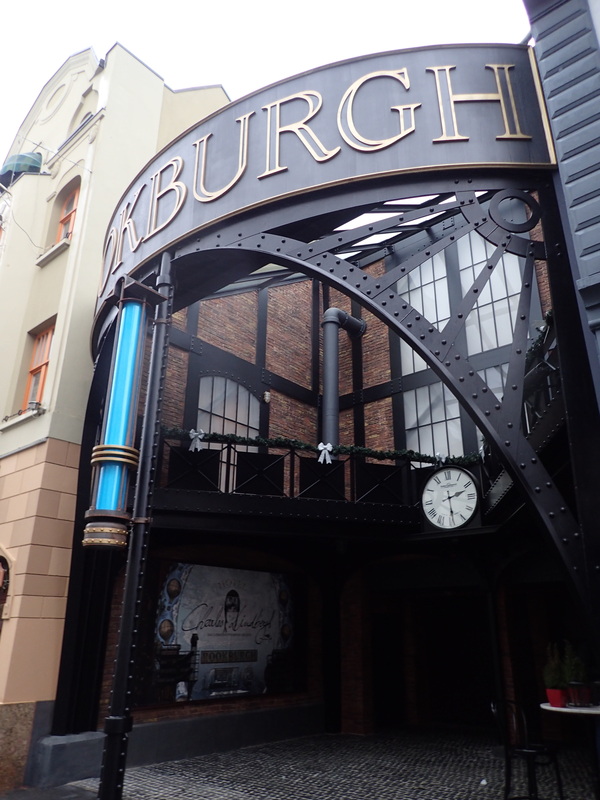 The entrance of the area now has the Hotel Charles Lindbergh poster hanging up as well! Right next to it, there’s Hotel Tartuff, one of the best decorated Fun Houses out there, now also with upside down Christmas tree of course! In Africa, we can now spot some special new visitors! 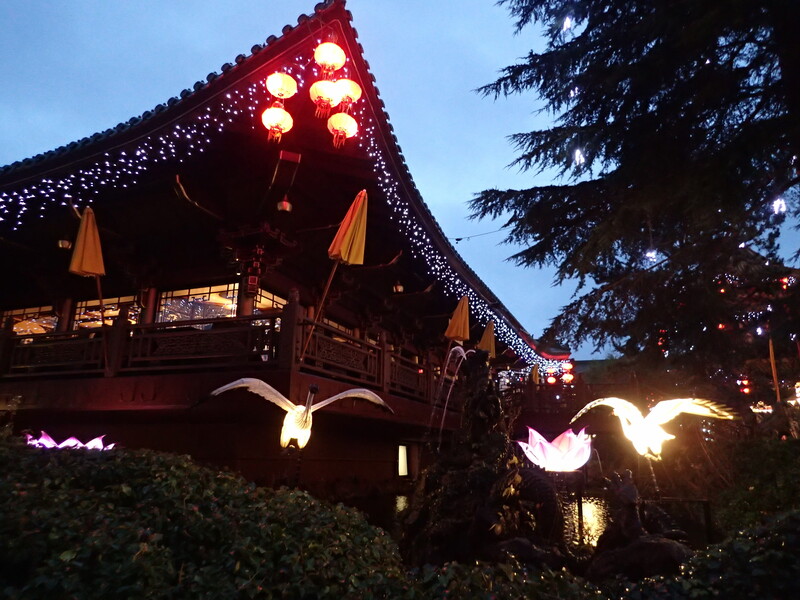 These Chinese light figures light up nicely at night, but also by day they look pretty cool! For the first time ever (mostly due to the weather), we did a show at the park! 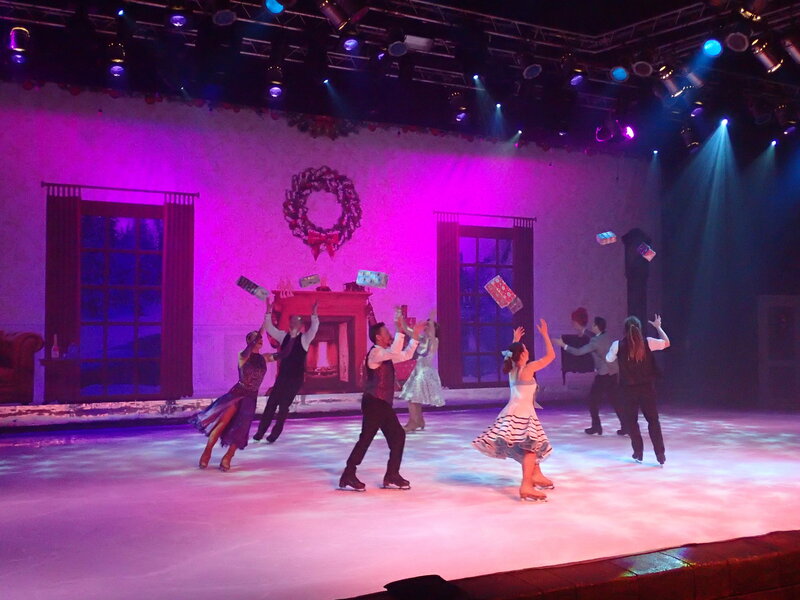 In the Mexican theater, you can always enjoy an ice skating show and once again we were back into Christmas atmosphere! 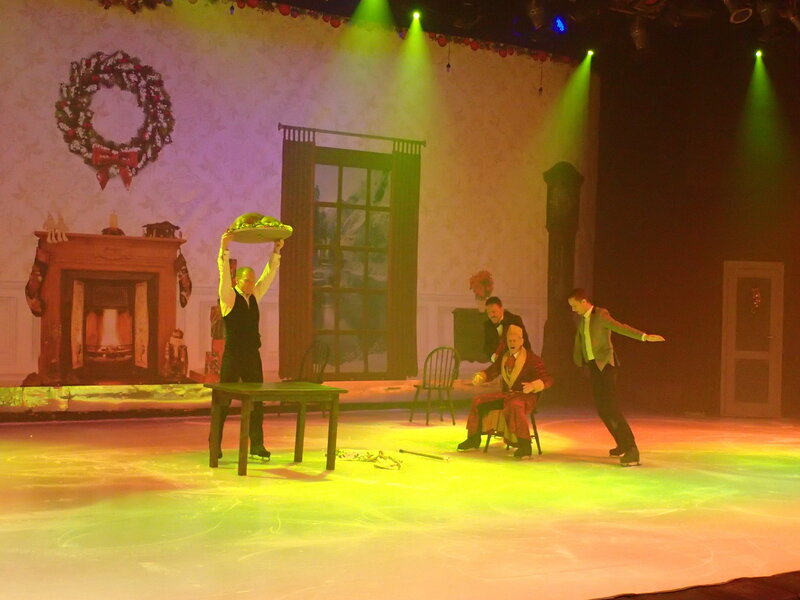 Honestly, I don’t know a lot about ice skating, but the acting in the show was fun to watch too. Cheers to the cast! 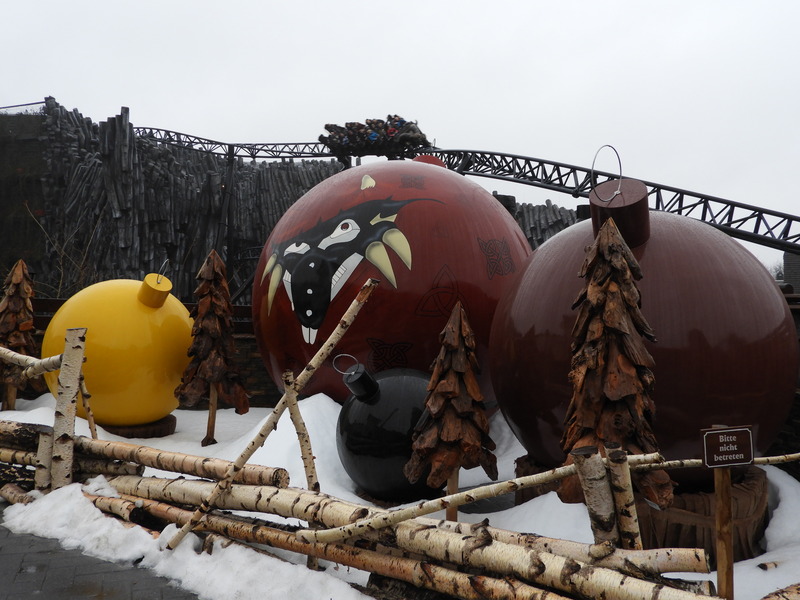 Back in Klugheim, they added decorations to fit the winter theme but subtle. 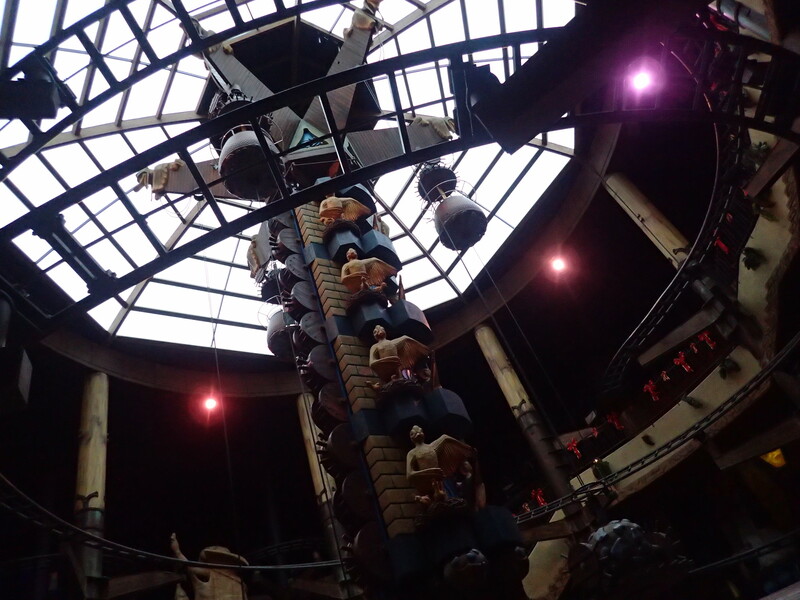 Perfect to have the atmosphere all over the park without losing too much focus on the real theme. 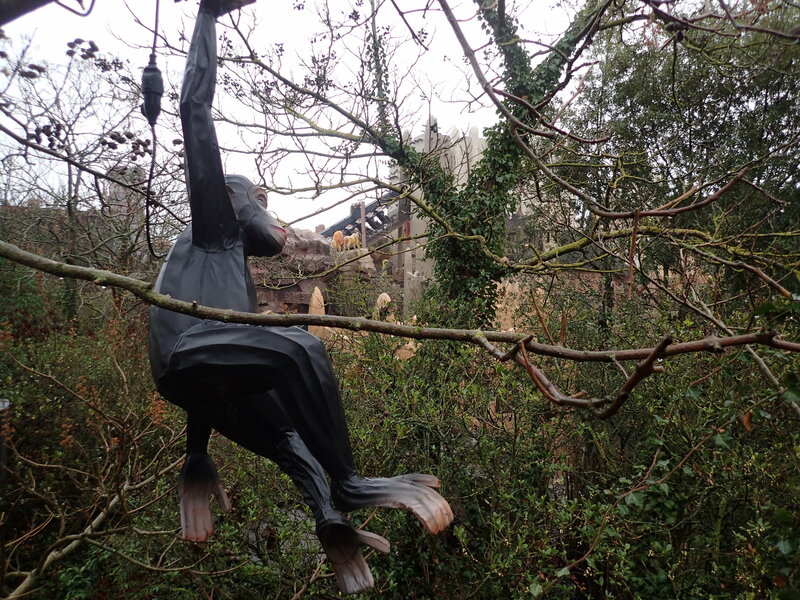 Due to the weather, it ran wild! 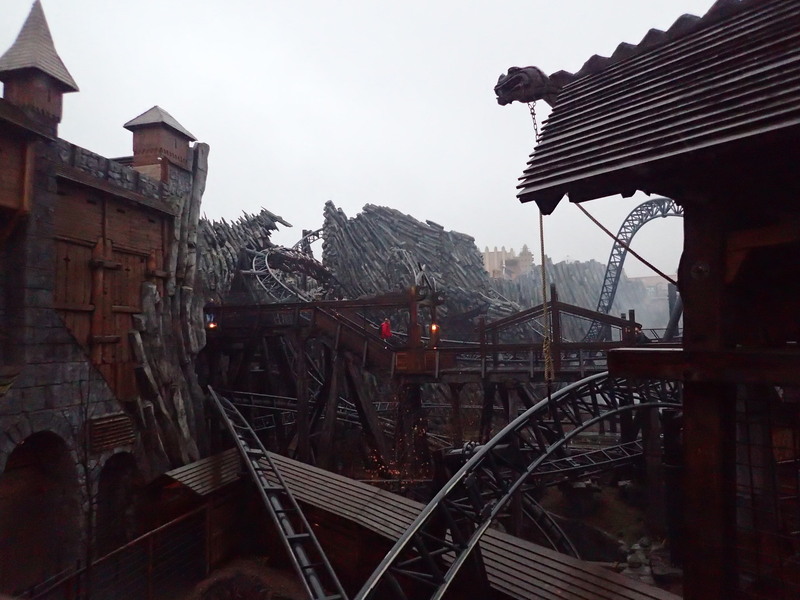 Not every ride feels the same on Taron, but this one did not disappoint at all! Congrats also to my mom who was brave enough to get on! 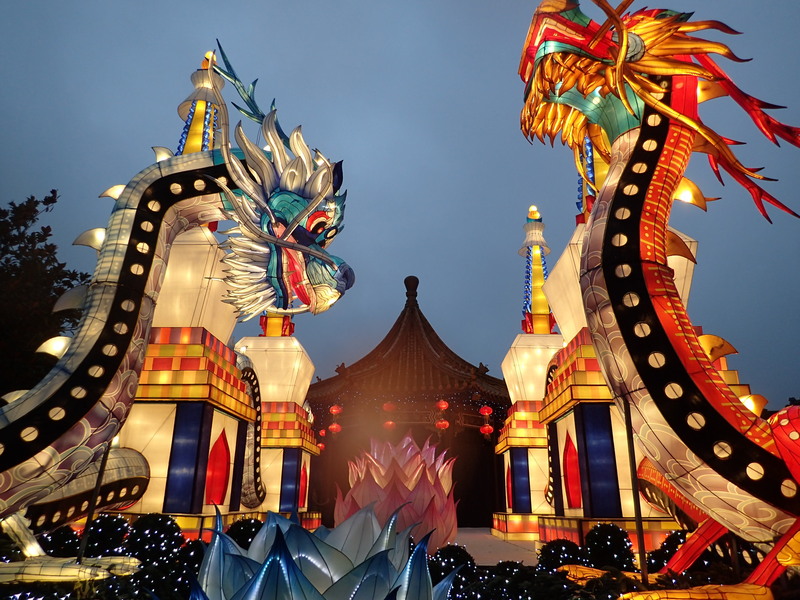 In China, instead of the outdoor show area, they have this giant dragon light figure on display. It really adds to the atmosphere of already a wonderful area. Besides River Quest and Winja’s Fear, all other major rides were open. This includes Chiapas (with Christmas Chiapas music)! 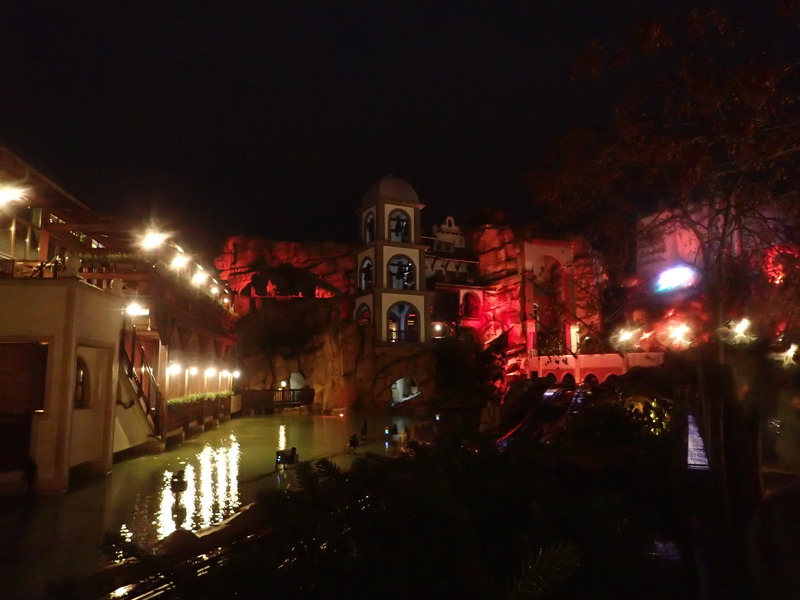 The ride does close earlier for a wonderful spectacular on the building: Templo de Fiesta. Due to copyright reasons, you’re not allowed to take pictures or videos. We can tell that it’s worth to watch, especially the fire show at the end. 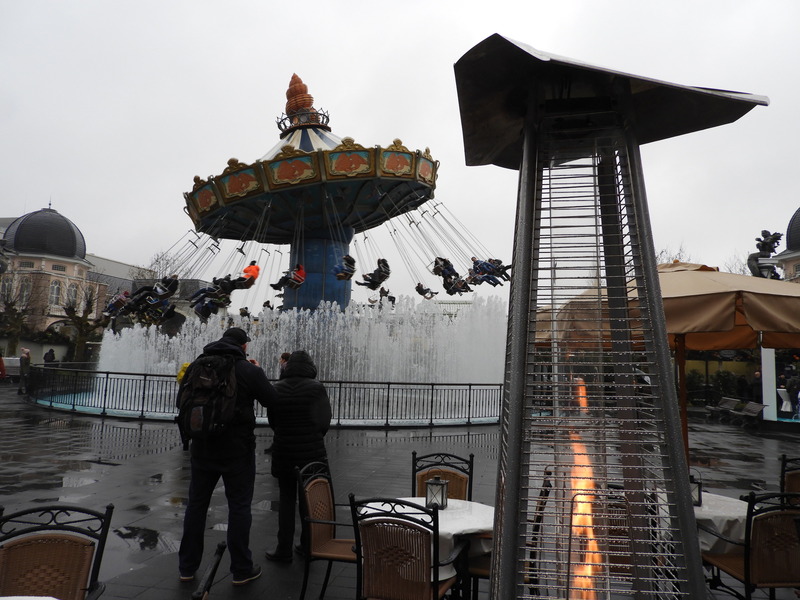 Think of first project mapping and then Aquanura/World of Color fountains but fire instead! Spectacular ending for sure and the warmth was more than welcome. Not a mind-blowing show but a more than welcome addition during the Wintertraum season. 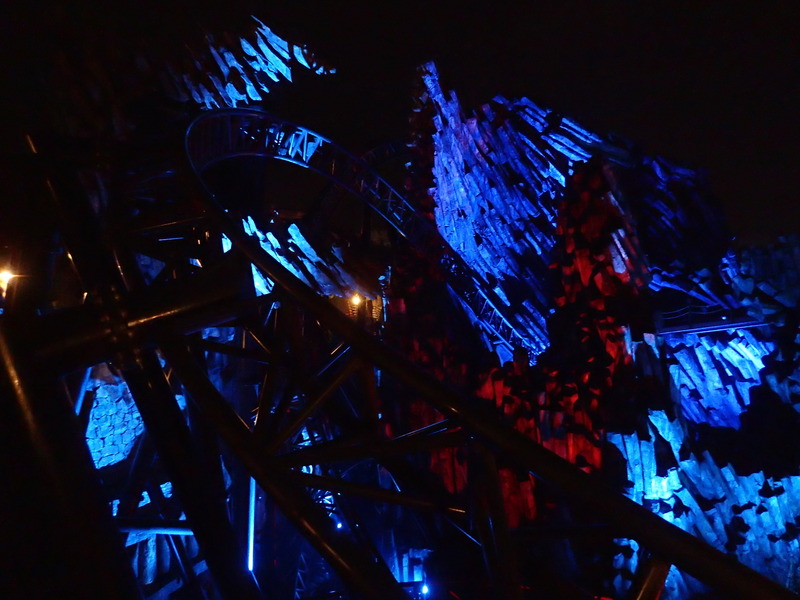 The big plus about visiting during this time of year: riding the rides in the dark. Black Mamba really packs a punch by the end of the day, backseat, in the dark! 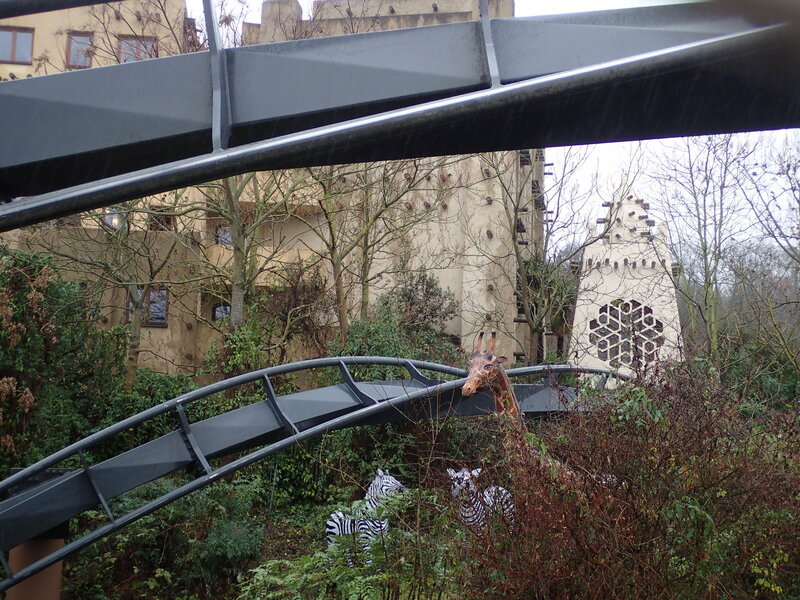 Definitely one of the most intense coasters in Europe! So riding Talocan after that was a bit hard, but our private ride during the day was awesome! We got some extra hang time during the final spin due to the lack of weight which was really intense! 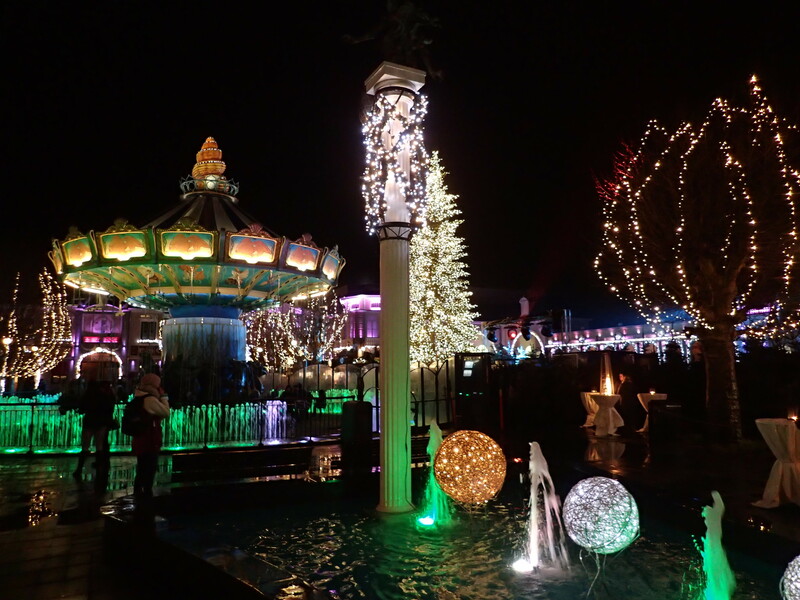 Back in Berlin, the Christmas atmosphere really lights up the square in the dark! We didn’t stay for the fireworks, but we ended our day the best way possible: a ride in the dark on Taron! 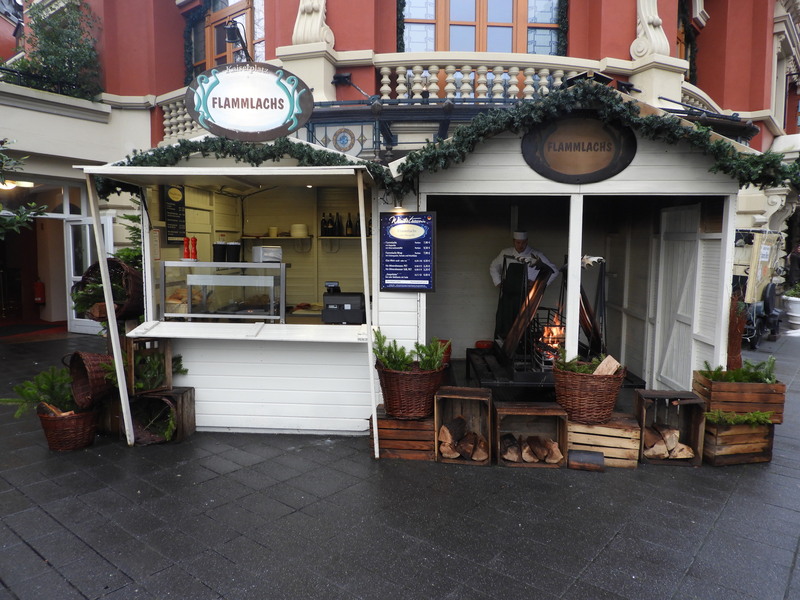 Wintertraum at Phantasialand has pros and cons. 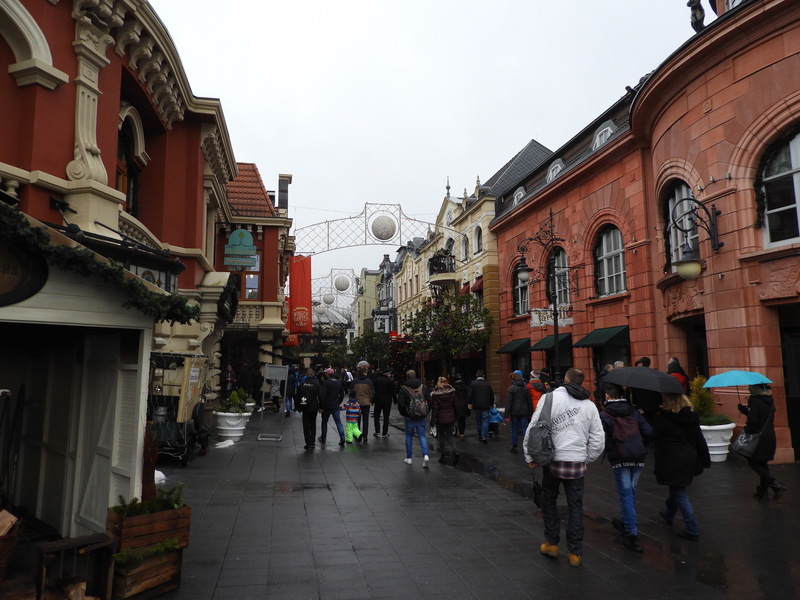 It’s can be cold and wet, no River Quest and more Christmas than Winter atmosphere. 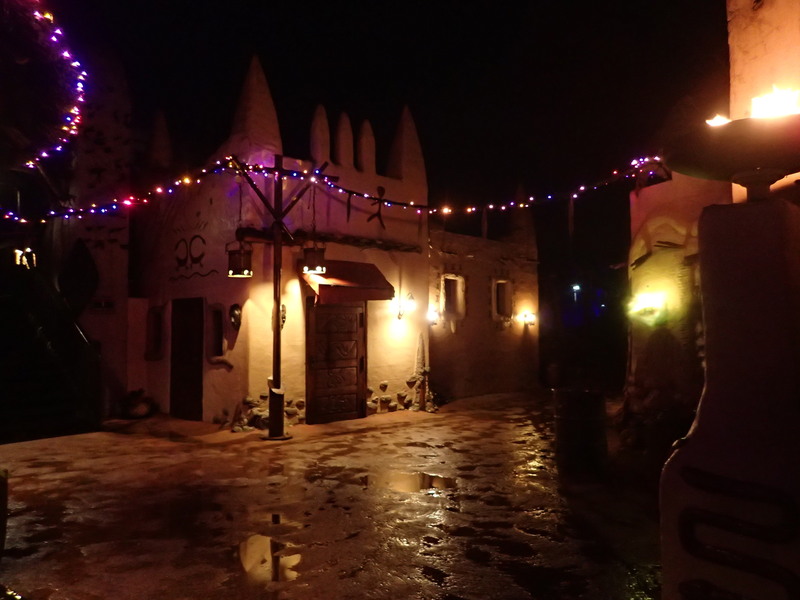 But in return, you get low crowds (outside of the Christmas Holidays), rides in the dark, slightly extra entertainment and it’s a perfect way to start your theme park year! 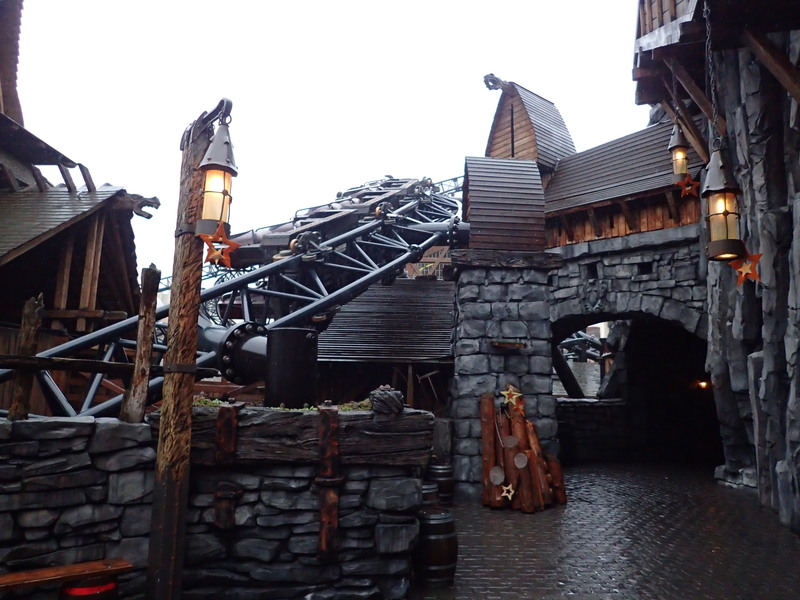 Thank you for reading our Phantasialand Update! Check out our previous European post: Top 15 New in Europe of 2018! 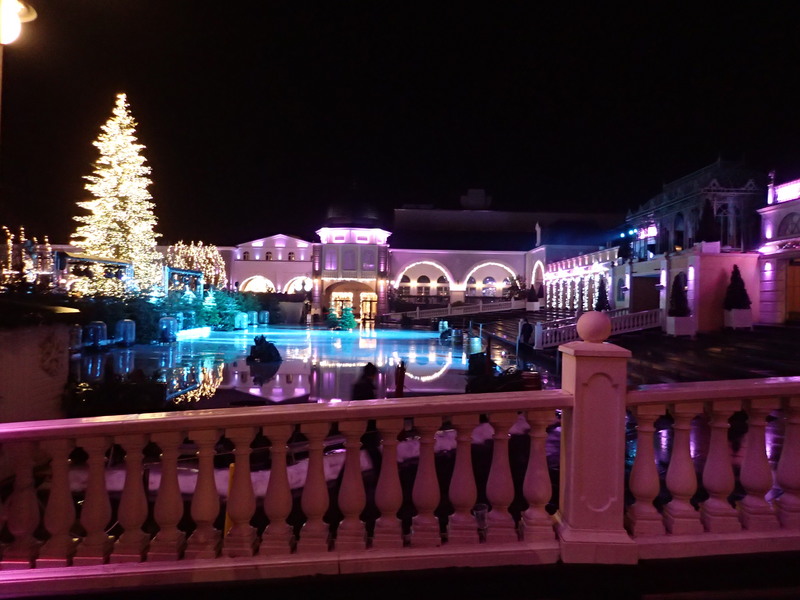 We also have a new Seaworld (click here) and Universal Orlando (click here) Update!